Hello everyone, welcome. Today I wanted to talk about something that is a relatively new experience for me, but is as old as the hills for loads of others, and that is the Dungeons and Dragons actual play. 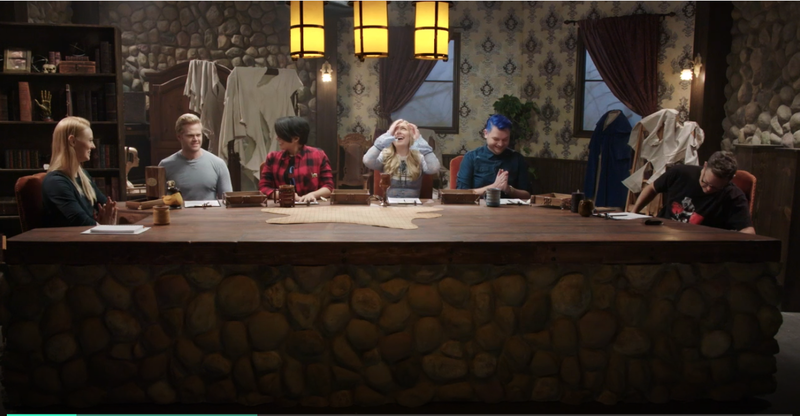 For a lot of DnD fans out there it might actually constitute rpg heresy to say I have never actually watched Critical Role, or (before now) any other DnD actual plays. I have watched many many hours of the Twin Cities by Night Vampire: The Masquerade actual plays, and I think I will be talking about them in the near future in a separate post. Though, I seriously recommend them if you wanted to see more about a Vampire game. Chris, who runs the core Twin Cities story, set in Minnesota & St Paul is a fantastic Vampire St whose Ideas I have shamelessly appropriated, and Joaquin who ran the Victorian Chronicle (which was his first time being ST and my first exposure to Victorian age Vampire) was excellent too. Follow them on Twitter @Twin_Cities_VtM , find them on the Twin Cities Youtube or their Twin Cities Itunes. Anyway, enough of that. As I say, I have never really engaged with the DnD actual play because I was always more of a fan of other games, however that all changed last week. Since before Christmas I had been seeing pop up adverts for the Project Alpha service, which shows a whole bunch of Geek and Sundry, as well as Nerdist Stuff. Truthfully, I don’t really have a lot of experience with either outside of knowing that they exist. One of the things advertised was a Vampire: The Masquerade actual play, LA by Night and that got me intrigued but not enough to tip me over the balance. Plus, I believe a lot of it eventually makes it to youtube legitimately anyway (correct me if I am wrong). Then I started seeing adverts for a show called Relics and Rarities, hosted by Deborah Ann Woll of True Blood and Daredevil fame. Again, this might not have been enough to tip me over the edge though it was certainly pushing me that way, what did it for me was seeing some of her guest stars. I will come to that in a minute. The Premise, 4 adventurers are invited to a curio shop owned by Professor Roundland, an old gnomish woman who is an agent of the Relics and Rarities brigade. They are then sent on an adventure, accompanied by a special guest (or at least that was the format for episode one, and I presume it will be repeated). This is a fairly standard setup for a Dungeons and Dragons game, and I guess actual play too, however I have to say I was singularly impressed with the actual play, episode one, The Haunting of Benthem Manor. The Story was a ghost story, where our adventuring party had to go round a spooky manor solving riddles, clues and puzzles. Again, fairly normal. What stood out for me were the following factors. The players were fantastic. Truthfully, they could be relatively famous in the actual play community (or they could just be famous and I missed that…) or they could simply be friends of the show. They were very good. Deborah was a fantastic DM. She flowed from one scene seamlessly to the next, without ever missing a beat regardless of what was asked by the players. There were even some really cool scenes where the players communed with ghosts via a seance, using a prop provided by this week’s guest (and presumably guided PC/NPC), played by Matthew Lilllard of Scooby Do fame (he played the live action Shaggy and now voices him, plus he was in Scream if you didn’t know), to great atmospheric effect. The production quality of the actual program was high as well as the gaming components. There were a lot of really cool props though I guess that is what a production budget attached to a game gets you. For instance, a puzzle door where the players didn’t roll dice to solve but actually had to turn dials until a path was found. Really cool stuff. Matthew Lillard was a fantastically over the top Dragonborn who sounded just a little like he hails from my homeland (and has a more of native accent than I do…), and the other guests of this series look like they will also be awesome, and by that I mean we have among others, Charlie Cox of Daredevil fame and Kevin Smith of Kevin Smith fame. The show was 2 hours long so didn’t feel like a massive commitment of time, and the story was more or less contained (the haunt was resolved but the bigger story is still at large). I thoroughly enjoyed watching this actual play and am very much looking forward to the second part which is on today (actually, I’ll be sleeping when it comes on, but I’ll get it another day). Of late I have been playing more DnD, and I do like the Matt Mercer videos on how to Dungeon Master, so I might give Critical Role a look as well. In all of my copious spare time. Have you seen Relics and Rarities? If so, what were your thoughts? Update – Sadly project alpha is closing down March 2019. Their content will all be appearing on Twitch is my understanding. However, some of their content including this episode is now on Youtube. Enjoy. I want to see it! I didn’t know Deborah Woll was a Dnd person.